By way of beta testing the ability of my newly-printed postcards to withstand the travails of the postal system, I mailed one to myself on Tuesday afternoon; it arrived in this morning’s mail, two days later. Not only are the aesthetics of this offensive, but the lack of a postmark removes any formal record of the postcard having traveled through the mail at all. My postal sources tell me that the likely reason for the pen-cancellation is that the postcard could not be mechanically sorted, needed to be hand-processed, and the postal worker who did the processed was not equipped with a cancellation stamp. 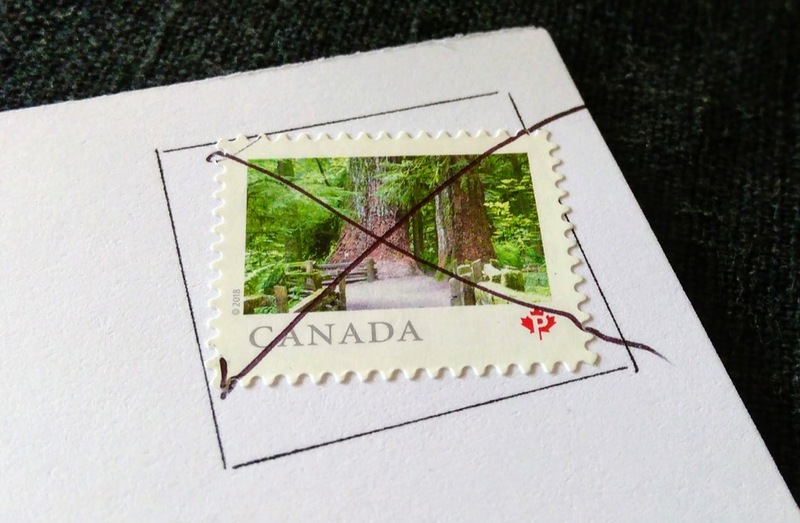 Even when this doesn’t happen, and the robots can do the sorting, the postmark and cancellation applied are for Nova Scotia, not Prince Edward Island, resulting in a troubling absence of postal sovereignty. The same sources tell me that I can take mail to the central post office on Kent Street to be hand-cancelled; that’s my next test. Written May 10, 2018 at 5:06 p.m. I had three letters come back this week with the pen stroke through the stamp as it needed more postage. I did take my mail to the post office to be measured and weighed. Fortunately, when I went back they corrected their error. I was puzzled if I could just add more postage to the crossed out stamp or if I had to start again. I confirmed at Charlottetown Station Central of Canada Post today that I can have lettermail hand-cancelled upon presentation there. They have a lovely hand-stamp that they bring out to do this. I can’t imagine ever sending mail any other way than this in future. Apparently the same hand-cancelling service is available at the Green Gables Post Office in Cavendish in the summertime.